Dr.P.J. Devereaux at McMaster University in Hamilton and colleagues conducted POISE trial and have found out that after undergoing noncardiac surgery, patients with heart disease who were treated with the beta blocker metoprolol for 30 days were less likely than patients who received a placebo to have a heart attack, but more likely to die or have a stroke.The research has been presented at the American College of Cardiology’s 67th Annual Scientific Session. These follow-up findings confirm that an increased risk for death or a stroke persists at one-year post-surgery in patients treated with metoprolol, said P.J. Devereaux, MD, Ph.D., director of cardiology at McMaster University in Hamilton, Canada, and lead author of the study. Previously reported results from the same study at 30 days post-surgery showed a similar pattern, with a reduction in heart attacks but increases in deaths and strokes. “Our results suggest at one year, for every 1,000 patients having noncardiac surgery, treatment with metoprolol would prevent heart attacks in 12 patients but would result in an excess of 13 deaths and six strokes,” Devereaux said. Beta blockers work by slowing the heart rate and relaxing the blood vessels, which in turn reduces blood pressure. The problem, Devereaux said, is that during the period immediately after major noncardiac surgery (such as a hip or knee replacement, bowel resection or abdominal aortic aneurysm repair), patients are usually treated with opioid medications to relieve pain. The effects of those medications may mask drops in blood pressure or heart rate to dangerously low levels. “Low blood pressure, or hypotension, is common in this setting and is the main contributor to the adverse effects resulting from perioperative beta blockers,” he said. Patients who become hypotensive for whatever reason after surgery (e.g., sepsis, bleeding, heart failure) find their problem exacerbated when they are receiving a beta blocker, which further lowers blood pressure and makes treating hypotension more challenging. The PeriOperative Ischemic Evaluation (POISE) trial enrolled 8,351 patients in 23 countries. Eligible patients were 45 years or older and had a history of heart disease, blood-vessel disease, stroke, congestive heart failure or other health problems such as diabetes or impaired kidney function. Patients’ median age was 69 and 63 percent were men. Patients were randomly assigned to receive metoprolol or a placebo, beginning a few hours before surgery and for 30 days afterward. Patients, health care providers and research staff, except those analyzing data, were blinded to which group received metoprolol and which received a placebo. The study’s primary endpoint was a composite of the combined rate of death from heart disease, nonfatal heart attack and nonfatal cardiac arrest after 30 days. At one-year follow-up, fewer patients in the metoprolol group than in the placebo group had heart attacks (5 percent vs. 6.2 percent), but more patients in the metoprolol group had died (9.8 percent vs. 8.5 percent in the placebo group) or had a stroke (2 percent vs. 1.4 percent in the placebo group). These results followed the same pattern that had previously been seen at the 30-day follow-up: statistically fewer heart attacks in the metoprolol group (4.2 percent vs. 5.7 percent in the placebo group), but statistically more deaths (3.1 percent vs. 2.3 percent in the placebo group) and strokes (1 percent vs. 0.5 percent in the placebo group). 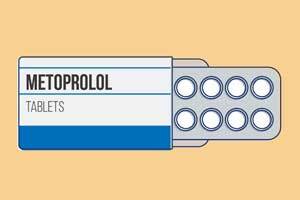 According to Devereaux, some observers have suggested that the metoprolol dose received by patients in the POISE trial (200 mg per day) was too high and that a lower dose would have produced fewer adverse effects. However, a lower dose might also have decreased the drug’s effectiveness in reducing heart attacks, he said, noting that the metoprolol dose in POISE only resulted in a seven beats per minute lower heart rate compared with placebo. “I believe the answer is more continuous patient monitoring during the immediate post-surgical period so that dangerous drops in heart rate or blood pressure are promptly identified and treated,” he said. Devereaux and his colleagues are currently conducting a study to test the effectiveness of remote automated patient monitors in reducing post-surgical cardiac complications. This observation does not seam to be convincing .It certainly requires few more studies to come to this ultimate conclusion .SUCH situations can come across on, if the person is already suffering from LBBB and a seasoned clinician will never do that . All contraindications of beta blockers will be observed and avoided by the seasoned clinicians . I red about trail where metaporol used few hours to non cardiac operation to 30 days after operation. You have said it is because of mask of low pressure/ hypo tension by opioids . But it could be drugs inter action It may bebecause of ,Denovo mechanism just seen in DNA nucleotide and nucleoside witch are and make the cardiac muscle prone for muscle abbe ration in their cardiac function concern with phsio- patho- biocemical protien signaling for death by epitopes to drug or enviroment.